You might dream of such kind of Tablet PC: light and easily portable but able to water/ dust proof, using commonly used operating system like Windows for work, much better with high standard CPU to maximum performance… Yes, Winmate 9.7” Rugged Tablet PC exactly makes your dream come true! Not only on consumer market, the trend of tablet PC but also has swept through industrial field. Based on previous successful experience in rugged tablet PC, Winmate has now unveiled a 9.7” rugged tablet PC that supports Windows Embedded 7 operating system to fulfill increasing requirement in industrial applications. The 9.7” rugged tablet PC R09ID9M-RTL1 provides an alternative solution for those between general consumer and extremely rugged application. 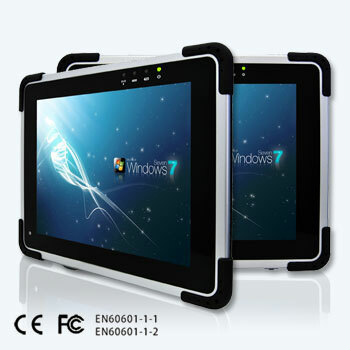 On the one hand, compared with consumer tablet PC, M970D satisfies 4 feet drop certificated and IP54 standard against dust and water splash and so that it can support higher environmental requirement as commercial and medical use. On the other hand, for those users who do not need higher rugged standard like military standard, the 9.7” rugged TPC is much lighter and portable than traditional rugged tablet PC. Moreover, M970D is approved by Europe Medical certificate EN60601-1-1 & EN60601-1-2 for medical field use. Made for professional work, M970D embeds Windows Embedded 7 on Intel Atom N2600 dual core processor. Various wireless devices including Bluetooth, Wi-Fi and optional 3G and GPS make communication with others possible and easy. In terms of I/O, in addition to basic micro-in/ line-out, the 9.7” TPC includes one USB and one port for LAN or HDMI. In addition, there is one programmable function key that can be flexible for users’ demands. With regard to the markets, Winmate release several accessories for M970D to fulfill different field application such as education, logistic, retail and public work. With the Europe Medical certificate EN60601-1-1&EN60601-1-2, medical is another application that doctor and nurses can read patients’ record via the 9.7” device. Moreover, school teachers can take it as a teaching tool during class with the capacitive stylus.